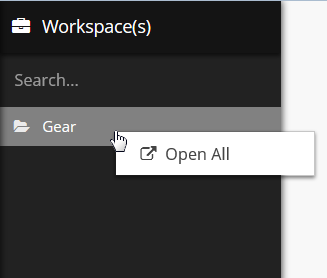 Documentation and SupportReleases 2015-09-29 ReleasesRight clicking on a Workspace allows you to open everything in that Workspace. 2. ...it opens all tables and dashboards inside the workspace. Zoom: ...it opens all tables and dashboards inside the workspace. Prev: Performance Logs table now shows Max Number of MySQL connections. Next: You can now open the configuration of a view without opening the view.